Retro Acid celebrates the joys that we experience thanks to the famous silver box, the Roland TB-303 bass machine, the machine that had such a huge impact on electronic music, and is still a big influence for many artists today. Retro Acid remains thé ultimate party for any 303 fan and its unmistakable Acid sound. 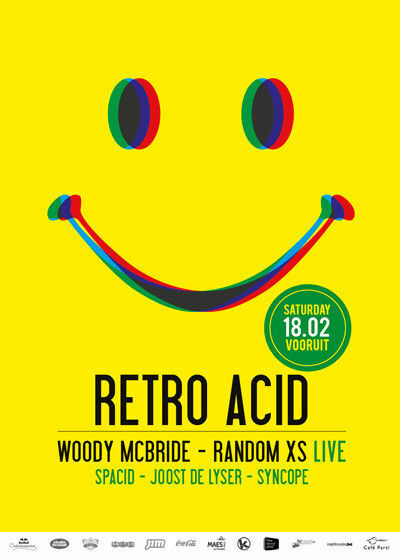 The reputation of Retro Acid even exceeds our borders with a growing number of visitors from all over Europe. Our first guest this year is Woody McBride aka DJ ESP from the States who toasts his magical party-meister career with a notable Resident Advisor Exchange Interview (http://www.residentadvisor.net/podcast-episode.aspx?exchange=67 ) last month and recent party-rocking releases/remixes such as a new mix LP/CD on Moist Music (in stores now). He has also been releasing on Bonzai, Full Flavor and Dave Clarke’s White Noise Records. But he’s off course best known for his own legendary Communique Records and many tracks on the equally legendary hard acid label Drop Bass Network. All those tracks are deeply engraved in the hearts of each acid lover. With classics like ‘Basketball Heroes’, ‘Put A Smile On Your Face’ and ‘Rattlesnake’, we are sure the party will wiz acid all over. It will also include a sneak preview of ‘BasketBall Heroes 3’, due for release in April 2012. As such Mc Bride is one of the few old skool artists who’s still busy today. Dutch underground acid-techno band Random XS always performs 100% live. As such, they are always providing a completely random factor. Rhythms are programmed on the fly, ingredients are replaced all the time. No two Random XS gigs are alike. The live atmosphere adds a new and unpredictable dimension: a random excess! After 20 years they still perform, but only when they feel the time is right. To celebrate the 20th anniversary of their ‘Give your body’ release, they will play a small series of gigs, starting off at our Retro Acid party! The line-up wouldn’t be complete without our resident Spacid, who was at the forefront of the underground party-scene in the 90’s through his Funky Green Aliens organization and has been pushing the early acid sound in Belgium since the very beginning. He will be joined by two other Belgian pioneers. First up is Joost de Lyser who has started dj-ing in 1987 and was and is a big part of the scene in Brussels, from Fuse club, to the legendary Network parties and more recently the Reboot and Enjoy Apocalypse parties. Last but not least, we bring you Synscope who has been involved in lots of steaming acid parties as ‘Drop acid not Bombs’ and the very successful and always sold out ‘Acid Soundz’. Next to dj-ing, he’s now also focusing on producing and we can expect more great things from this guy in the future.